A Wasp Control Treatment doesn't have to be a painful exercise for either you or your wallet. Do It Yourself Wasp Control seems very tempting, especially with all the products available on supermarket shelves. We advise to stay away from DIY methods and use a licensed pest controller who offers a warranty on their treatment. Wasps can get extremely aggressive and unlike bees, they can sting you multiple times. In no time these quick and nimble stingers can be all around you and become quite a painful experience. The most common type of wasp in South East Queensland is the paper wasp. Part of their survival is to hibernate during the colder months. When it starts to warm up the female wasp awakens and looks for a suitable place to build its nest. That is why you find so much more paper wasp activity in the warmer months. Normally in high places away from the elements and that means on house eaves, windows and trees. Why wasps are more dangerous than bees is because they are more aggressive. Wasps have been known to attack people simply by being in too close to the nest. Much like the sounding of an air raid horn, some wasp specie release a pheromone when the need is deemed to be under threat. This can be to action defensive behaviour all the way to an aggressive full blown attack. 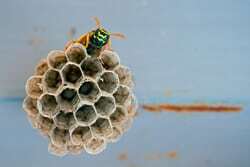 This proves to be problematic when the wasps build their nest in doorways or other access areas around the home or office. Knocking away the nest with a stick or burst or water from the hose will see you doing the 100m sprint in Olympic times. The paper wasps will simply regroup and build their nest right back on the same location. Keep an eye on the activity so you can inform the pest controller of any known areas nests or areas of entry. Paper wasps construct their nests from chewed wood pulp which is mixed with saliva. In spring they start off tiny and soon get to the size of a golf ball. Then in summer production is ramped up with the number of increasing wasps and explode in size! So time is of the essence and it is best to treat the nest when it is small. We leave the nest there and apply a low toxic chemical. Most of the wasps will leave the nest to attack the threat. This is where our bee suit comes in handy! When the wasps return to the nest they come into contact with chemical and are destroyed. That is why we leave the nest there in its place. What attracts Wasps to my house? A lot of things can attract wasps to your house but the largest tickle to their culinary senses would be fruit trees. They love feeding on overripe sweet fruit, honey or other sweet plant matter. 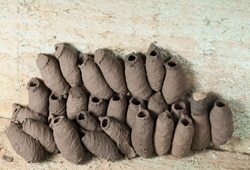 Wasps also attack insects which they digest, bring back to the nest and then feed the growing wasp larvae with. You can also find some wasps buzzing around bodies of water like pools or ponds in the back yard. Leave wasp control to the experts and get a licensed pest controller to do your wasp treatment. We can offer an express appointment and could possibly have someone out on the same day. To book a time is easy, simply call one of our friendly staff.